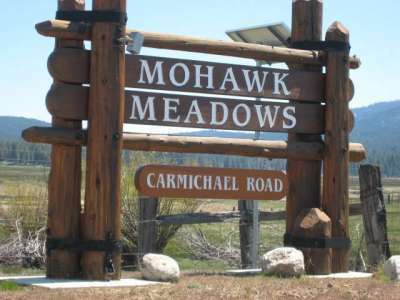 This special neighborhood is a true “GEM in the Sierras”… as you drive through the entrance from Highway 89 and meander thru the open lush meadows, grazing cattle, you quickly get the feeling — I could live here! Located in the “heart” of Mohawk Valley, Mohawk Meadows offers convenient year-round access…. underground utilities, maximum privacy and tranquility, as well as aesthetic architectural standards. The 350 acre subdivision is divided into just a few large parcels and 25 panoramic view lots averaging in size of 3 to 4 acres each. Most all homesites are built-out, displaying true mountain architecture and beauty. All property owners at Mohawk Meadows are members of the Mohawk Meadows Home Owners Association. A primary purpose of the Association is to maintain the private roads serving the community and to provide snow removal during winter months. The Association also provides structural fire protection through a contract with the Graeagle Fire Protection District.